In Economics we are interested in the point where the Supply and Demand curves intersect (the point of equilibrium). We can read the coordinate of the intersection off the graph or use simultaneous equations. 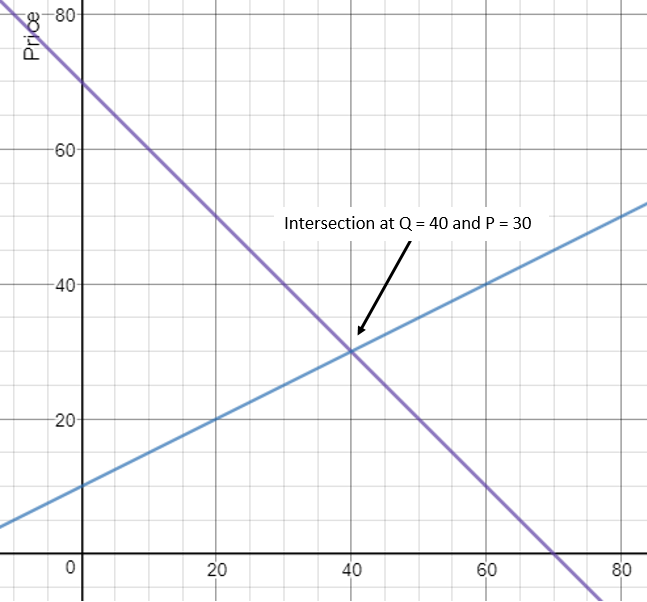 The intersection (equilibrium) is at Price = 30 and Quantity = 40. We use the rules of rearranging equations to solve the two equations simultaneously. Substitute the value of Q into one of the initial equations to find the value of P.
To find P substitute Q = 40 into one of the initial equations. The following video will take you through another example of solving simultaneous equations. Kahn academy use video to explain another worked example where the equations are rearranged differently and a set of practice problems that you can use to review your understanding.